Up until last Friday I possessed a grand total of two Amiibo figures. Now I own nine, and I’m eagerly awaiting the release of more. It’s too bad the game they’re attached to is a snooze-festival. How much did I not care about Amiibo figures prior to this past weekend? So much so that I had no idea the new Animal Crossing figures were showing up at Toys’R’Us on Friday morning. I stopped by there to see if the new Monster High dolls (my wife collects them) were out, and lo there was a table in the video game section containing two solo Animal Crossing figures—Tom Nook and Mabel—and a three-pack containing K.K. Slider and two sheep, Reese and Cyrus. Mewtwo was there as well, but he has nothing to do with Animal Crossing and can die in a fire. Back near the game case a sales associate was putting copies of Animal Crossing Amiibo Festival on display. The game includes Amiibo figures of Isabel and Rigby. As I left to check the Transformers aisle for goodies, I couldn’t help but notice that I had over a hundred dollars of Animal Crossing Amiibo merchandise in my cart. Surely that was a mistake. I put them all back. Then I went back and picked all of them up again except for the K.K. Slider three-pack. I went back for him Saturday night. Which is even more amazing considering that by the time I went back for them I’d already played the game. What I want is a full Animal Crossing game on the Wii U. What I do not want is the look and feel of a full Animal Crossing game over top of a mediocre board game and a handful of yawn-inducing mini-games. I suppose children might enjoy the virtual board game that forms the core of Amiibo Festival. It’s cute, featuring a lot of the core series’ most lovable characters. I guess the child inside me is a bit more grown-up than I thought—I just found the whole thing tedious. Here’s how a basic round plays out. Each player takes a turn rolling the dice, which is performed by real players by tapping their Amiibo figure on the sensor—since the game stores information, Animal Crossing Amiibo cards can’t be used here. The player automatically moves the number of spaces indicated, ;anding on either a happy or sad square. Depending on the type, players will either gain or lose money, happiness points or both. At the end of the game, which runs either a full calendar month with each day a turn or when a player set timer runs out, money is converted into happiness points, and the player with the most points wins. There’s very little strategy here. Players will occasionally get in-game cards which can be used in lieu of the dice roll (and at the cost of bells) to influence their turn, and after the first week players can purchase turnips on Sunday to sell during the week, with different places on the board offering different prices. Aside from that the game is pretty much random rolling and moving—no screwing over your teammates, no competitive mini-games—it’s all about friendship, which is nice. It’s also putting me to sleep thinking about it. There are some pretty nifty ideas in the game. For instance players choose a month in the year before playing, each featuring special events based on the real-world holidays occurring during said month. December 24 is Toy Day, when all players get presents, which sounds nice but since everyone gets the same thing they’re all even afterwards anyway. And then there are special visitors that pop up randomly throughout the game, pinning special events to board spaces for the span of a turn. Visitors like Katrina the Fortune Teller, who deals a tarot card that gives certain dice rolls bonuses for a limited time. It’s nice to see them show up, but by the time the third player lands on one of her spots and we have to listen to her spiel again and again I wish she’d leave. Amiibo Festival also includes a series of mini-games, unlocked (along with new outfits and such) as your Amiibo figure levels up and collects some sort of happiness something or another. I’ve played two so far, and they’re not great. This is where your Amiibo cards come into play (three are included in the game bundle). In Balloon Island the player must tap an Amiibo card to the sensor to drop a character on some balloons, popping them for points. I also unlocked what might be the most annoying use of collectible cards ever, Acorn Chase. The player picks three Amiibo cards. Those three characters enter the game level and must pick up acorns while avoiding a lawnmower. In order to move, the player must tap the card corresponding to the direction they want to move on the sensor. This is not very fun at all. 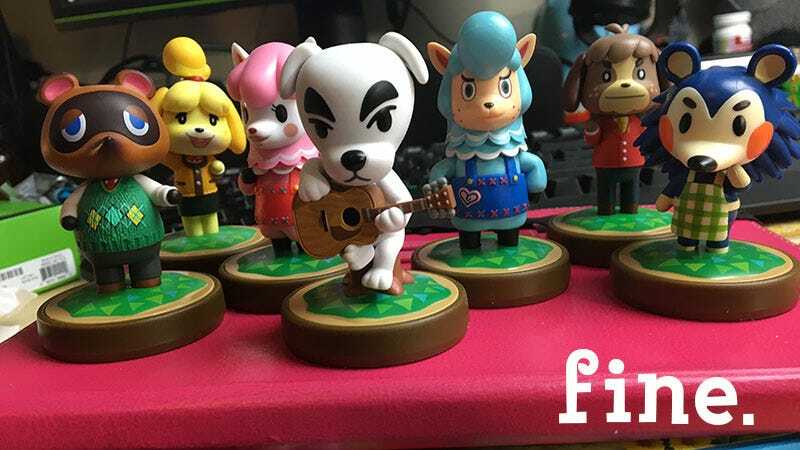 So I’m not a fan of Animal Crossing Amiibo Festival the game. It’s not really about the game. It’s about having Mabel sitting on my desk at all times. You finally got me, Nintendo. I’d been holding out so well, telling myself the figures were nothing more than pricey downloadable content unlocks. Now I am eagerly awaiting next week’s Lottie release, and you better believe I’ll be grabbing Celeste and Kicks in January. Hell, I’ll even grab Resetti. If this situation has taught me anything, it’s that even the most annoying characters can find love. Update: Check out CallistoEX’s comment below for more on some of the advanced features unlocked as you play through the game. To contact the author of this post, wait in line at Toys’R’Us, write to fahey@kotaku.comor find him on Twitter@bunnyspatial.